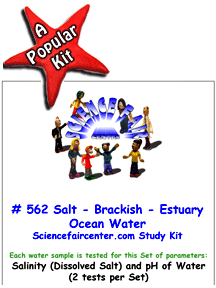 Saltwater – Brackish Water – Estuary Water Test Kit. Salt levels and concentration along with pH in ocean water, estuaries, bays and salt water intrusion studies. Saltwater – Brackish Water – Estuary Water Tests samples from ocean water, estuaries, bays and salt water intrusion etc. for salt (NaCl) concentrations and pH. Experiment for a first time science fair project. Testing only takes a few minutes per sample. Each water sample is tested for this Set of parameters: Salinity (Dissolved Salt) and pH of Water (2 tests per set). Experiment for a first time science fair project. Water samples from ocean water, estuaries, bays and salt water intrusion etc. are tested for salt (NaCl) concentrations and pH. Testing only takes a few minutes per sample.